I figured your system might need a little cleansing after the holiday chow. Don’t be surprised if you’re transported to warmer weather when you eat this salad. We found it on our last trip to New York at the NYU quicky mart called Whole Planet. It’s so simple to make, it’s so festive to look at and of course just too damn delicious to pass up. It would make a great addition to any potluck or buffet. Be sure to earmark this for the summer too. It was a little tricky to get the slippery halves to stay put – I cheated by putting a paper towel underneath. Funny thing – I went the grocery store to get cilantro so I could make this – I had everything but. Then what did I do – forgot to add it for the photograph – not to worry though – it was included before we snarfed it down. EASY – FESTIVE – DELICIOUS!! I’ve been craving salads for the past couple of days and this one looks fantastic right now! Right up my alley! Colorful and healthy. You are right, was can all use a dose of lighter meals these days. Happy New Year! Avocados are my absolute favorite food. This looks delicious! I love avocados any way you serve it. This looks festive for the holidays with all the goodness on one plate. This is so colourful and gorgeous! I love avocados so how can I resist making this?! Thanks! Perfect for after the holidays and so celebratory! Now that is pretty! 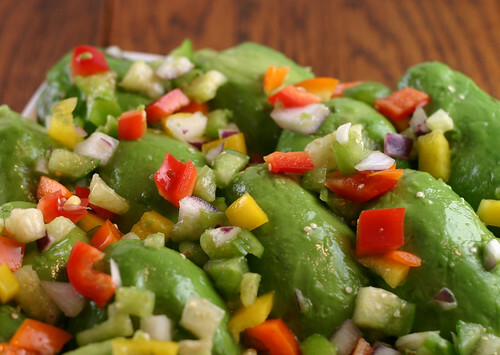 And who wouldn’t want to detox with avocado and peppers. This looks fantastic! What I wouldn’t do for some fresh veggies right now. mmm, this salad has all the tex mex flavors I love. Great idea, Cheers! It would have been nice if the recipe had been included! The recipe for tomatillo salsa is highlighted at the bottom – just click on it and you’ll be taken to the tomatillo salsa – that’s all it was, just avocado halves with the salsa poured/sprinkled over the top.